The Volca FM’s front-panel livery is certainly reminiscent of its Yamaha forebear. 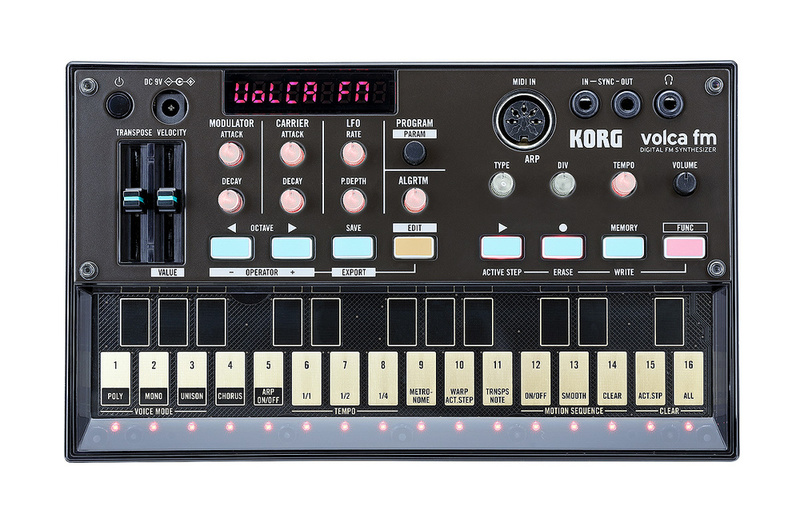 When it comes to FM synthesis, Korg’s little Volca is thinking big. When it comes to supplying small, affordable and intuitive items to today’s electronic musician, Korg have a firm but friendly grip on the market. Their latest contains a surprise blast from the past — specifically, 1983. This was the year MIDI was launched, but it also marked the appearance of Yamaha’s hugely successful DX7. Its impact may be hard to appreciate now, but at the time, frequency modulation (FM) synthesis was an icicle in the heart of fuzzy old analogues that couldn’t deliver a convincing tubular bell to save their lives. Thanks partly to the rise of affordable samplers, FM’s reign was relatively brief, but it could have been so different. If you’ve ever seen a photo of the huge Jellinghaus programmer (with maybe 200 knobs and a bunch of switches), you’ll appreciate how many FM parameters lurked inside that brownish DX7 shell. Arguably, Yamaha never did manage to put the fun into FM (coming closest with the DX200 groovebox), so you have to admire their plucky countrymen at Korg for having another crack. Of course it seems incredible that the synthesis engine that spawned that Jellinghaus monster could ever be squeezed into a tiny Volca, but that’s exactly what Korg have done. With only a few minor omissions, the Volca FM is armed with the entire 6 Operator DX7 voice structure — and to prove it, will happily accept patch dumps taken from the original Yamaha machine. Joining the regular Volca step sequencer you’ll find built-in chorus, patch memories, three notes of polyphony and a handful of controls. The Volca FM puts FM synthesis into a highly portable, accessible format, but is this enough to send cold shivers through the cosy analogue synth world as its illustrious predecessor once did? Sat amongst its siblings, this Volca most closely matches the Volca Beats, thanks to its smoky black plastic exterior and gold keyboard. The underlying FM-ness is proclaimed by the dark brown panel, the naff beige of the Edit button and the hospital-green paint job of other buttons. I don’t know if this model works harder than the rest, but I found its response a tad slower and in need of a firmer touch. Since Korg’s babies are practically ubiquitous now, there’s no need to resort to dated comparisons such as videotape-sized. 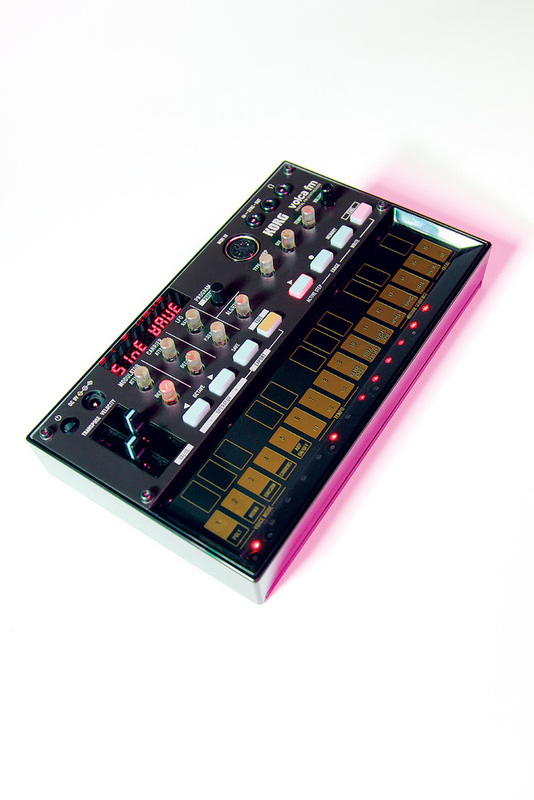 Volca-sized is familiar-enough — and this one, with its tinkly FM tones and built-in speaker, might be the coolest high-tech musical box yet. The controls are the same closely packed knob-shaft types seen before, and just one of them (Program/Parameter selection) is an encoder. A pair of decent-feeling sliders provide global transposition (handier than it sounds) and velocity, the latter switching to a data entry role when in Edit mode. Naturally, the Volca FM is fitted with a MIDI Input, but there’s no output; I’ll explain later why this feels like an unfortunate omission. For connectivity to Electribes, other Volcas or the SQ1 sequencer, you’re supplied with the usual Sync in and out jacks and a suitable lead. Continuing the Volca tradition for all things miniature, the main audio output (doubling as a headphone socket) is a mini-jack. Its output is mono, except when you activate the unison mode or chorus. For power, it’s another batch of six AAA batteries or an optional power supply. Korg aren’t giving much away in their one-sheet, multi-language ‘manual’ and if you’re interested in the underlying synthesis, you could do much worse than search for a copy of the original DX7 manual. This version of FM is based on six sine-wave operators, 32 algorithms to connect them and a pool of 32 patch memories to store the results. Not every DX7 feature is present, though, as I discovered when looking for portamento and glissando, both of which are missing. The DX7’s single LFO fares rather better; it’s here and sports the required six waveforms and ability to modulate the pitch or amplitude. Panel controls are supplied for speed and pitch modulation depth. Even if you aren’t lured by the idea of a portable sequencer, the Volca FM could be a highly credible digital synthesizer module. Admittedly, three notes do not a DX7 make, but for playing chords, three is a whole lot better than two! Once you’ve assigned the MIDI channel, pretty much all you need to do is make sure reception of ‘short messages’ is enabled. You can then play notes and tweak a handful of parameters from your master keyboard, without ever touching the Volca FM’s tiny knobs and shiny keyboard. All the clear knobs (except tempo) have an associated MIDI CC, and you can MIDI-control the transpose and velocity sliders too. However, you’ll notice that incoming note velocities are completely ignored — the velocity slider’s position sets the value for all notes. While this is quite limiting for conventional playback, it becomes more useful when sequencing, whether via the on-board sequencer or when driving the Volca FM from something external with a bit more poke. Spin the Program encoder and you’ll hear examples of the chimes, organs, woodwinds, electric pianos and other tones that are FM’s pride and joy. The ephemeral harps and acoustic guitars are as convincing as is possible within a three-note limit, and even the up-front electric basses become much less cheesy once you add a spot of real-time tweaking. Surprisingly, it’s not the bread-and-butter sounds that make this such a cool little synth, but the ease by which turning a few knobs can transform a guitar into a visceral PPG bass, or an organ into a mellow whistle. In the past, such feats were rarely associated with FM synthesis and are not to be underestimated now. The presence of factory sounds gives this Volca an edge over the simpler earlier models, but the real value is felt once you tackle that once-scary proposition: FM programming. Push the squishy Edit button, and the Program encoder switches to parameter selection. This, plus the data slider and Operator buttons, is all that’s required to navigate and interact with the menu system. Although, inevitably, the parameter list is long and the display petite, Korg supply a printed card with all the abbreviations and algorithms. It’s worth keeping the card handy until something remarkable occurs: you realise you’ve committed the lot to memory! Much has been written about the DX7 and here it’s enough to say that its 6-Operator implementation of FM has more scope for complexity and subtlety than the 4-Operator version, for obvious reasons. Korg’s idea of making algorithm selection into a readily accessible control is a master stroke. Switching from an algorithm consisting of a long modulation chain to another with few or no modulators is a valuable learning exercise, as well as a source of instant new sounds. Here, the card’s algorithm diagrams are particularly helpful; they illustrate the flow of every algorithm and, by colour-coding, identify the carriers and modulators in each. Even without any kind of reference, you can quickly gain a tweaker’s feel for FM courtesy of global envelope controls for the carriers and modulators. With the envelopes tamed, this beast of a synthesizer becomes positively eager to produce the sounds you’re aiming for. Patches can be named directly from the hardware, but when it comes to saving them, I could discover no direct means of specifying any patch location other than the current. It’s not all a game of DX7 catch-up either. For a start, Korg have added a stereo chorus: a gentle swirl to introduce a flutter of movement to the sometimes too-perfect sheen of FM. It helps to overcome the perceived weakness of DX synths at producing string ensembles (although let’s face it, most analogue string machines deprived of their chorus sound pretty limp too!). Of potentially more interest is the trio of voice modes: poly, mono and unison. There doesn’t seem to be a unison detune parameter, but even at the fixed setting, it sounds pretty good; the available voices are spread thickly across the stereo spectrum and instantly wipe mono mode’s single voice from short-term memory. Poly mode was consistently the most fun, though, even given the three-note maximum. When programming sounds, it’s worth remembering that the voice mode and settings for chorus and arpeggiator are not stored in each program but at pattern level. A Volca would only be half-complete without a sequencer — and by now, we’ve come to expect the inclusion of motion sequencing and a few tasty morsels besides. There are 16 pattern memories, and each stores notes, plus slider and knob movements. The clear knobs flash during playback whenever their motions have been recorded, but sadly the deeper edit functions are ignored, nor can any of the recorded data be edited later. You can, though, clear it and start over, or choose whether or not the captured values are replayed with smoothing between the steps. Patterns are limited to a maximum of 16 steps and three notes per step, recorded either from the small Volca keyboard or from your MIDI controller. This Volca doesn’t swing. Instead, it’s fitted with a more unusual method of groove redistribution, part of which we’ve seen on other models. To begin with, the Active Step function is used to dynamically shorten a pattern, down to a single note or motion event if necessary. Chopping out chunks in this way is great fun, but sooner or later, it’s going to trip up the pattern’s synchronisation. 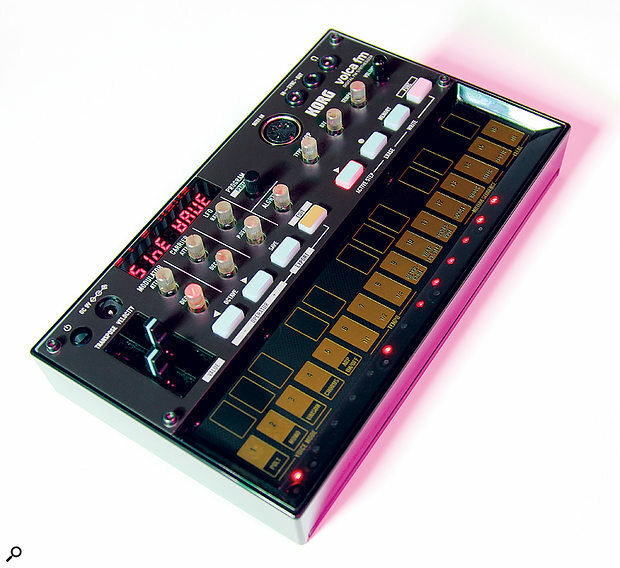 Here’s where Korg have a new concept to try out on us: ‘Warp Active Step’. Switch this on and a pattern’s active steps are stretched to fill any gaps you’ve just made, thus restoring the apparent length to 16 steps. Perhaps the most obvious use of the technique is to obtain a triplet feel but if, for example, you remove eight steps, Warp makes each of the remaing ones twice as long. Chop out an odd number and the resulting groove can be quite peculiar, sometimes in a good way. Regardless of how many steps are active, a pattern can be instructed to run at half or quarter speed. This might not seem eye-grabbingly vital, but it gains momentum when combined with functionality new to the Volca range: an arpeggiator. A pair of knobs selects the arpeggiator type and clock division. There are nine types to experiment with, divided into rising, falling and random patterns over a selection of octaves. Perhaps the only disappointment is the lack of latch, but this didn’t feel massively damaging in context. Combining the arpeggiator with the sequencer makes those 16 steps seem like many more. Rhythmic complexity can be added by motion-recording live adjustments to arpeggio type and clock division — and it’s now that those options to run below regular speed can spark your pattern into life. The fastest available division is shown as ‘1-12’ on the display, and heroically manages to play 12 notes on a single step. It’s sometimes hit and miss to record exactly the tweak you want on the required step, but slowing down the tempo can help. The sequencer lacks a ‘mute step’ function but does include Clear, which wipes the contents of all steps at a stroke. Repeating this operation invokes an undo and so could be considered as a crude form of pattern mute. Possibly one of the best features of the sequencer is actually a non-feature: there’s no Song Mode. This means that, unlike the Volca Sample for example, no pattern memories need be sacrificed. Instead, a simple chain function permits a series of selected patterns — up to and including all 16 — to run in sequence. Perfect! While the sequencer is fun, there’s a lot of pleasure in driving the Volca FM from an external MIDI source. When doing so, the Volca’s own patterns continue to offer value, such as for motion-sequenced parameter tweaks and pattern chains. In the latter case, it’s worth remembering that every pattern — even one containing only parameter tweaks — stores a pointer to a specific sound. Similarly, if you select an alternate sound during playback, the existing motion sequences are immediately applied to the new selection, which is a potential treat for lovers of ‘happy accidents’. 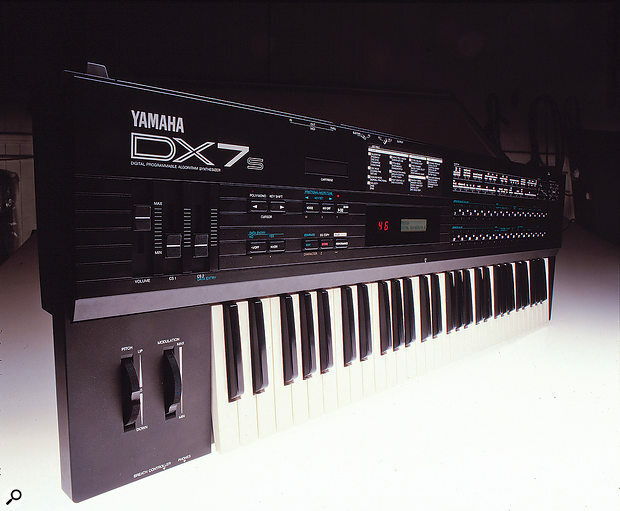 This later incarnation of the original, the DX7S, put a slightly friendlier face on FM synthesis. Judged by the wealth of sound banks turned up by a quick net search, you might have the impression that everyone programmed the living daylights out of their DX7s. Mixed with the billions (it seems) of electric pianos and brass patches are countless examples of the DX7 as a unique and powerful synthesizer. Every bank I downloaded from this massive free resource was squirted, without error, into the Volca FM. All this requires is a MIDI interface and a simple SysEx librarian. Surely I’m not alone in seeing this as a pretty awesome selling point?! It was while considering my first data transfer that I began to feel the lack of a MIDI output was, well... unfortunate. As it stands, the only way to back up any sounds you’ve made is by using the Sync Out jack. You’re meant to connect this to a second unit’s Sync input, then perform the ‘export’ function, but as I didn’t have another, I tried the next best thing, which was to record the output as an audio stream. Dark memories of the Sinclair Spectrum and squeaking cassettes surfaced uneasily, but fortunately it was a lot more fun than waiting for Leather Goddesses Of Phobos to load. You can dump individual patches or all of them, and the same goes for patterns, or even the entire machine. But I couldn’t avoid a pang of regret when I thought about the Volca FM’s missed potential as a very tiny DX7 programmer. I mentioned that all DX7 patches loaded effortlessly, but it’s worth emphasising that this even applies to those that feature split keyboards (created via the DX’s key-scaling). Thanks to the wonders of Yamaha’s original spec, your Volca FM can therefore play two sounds at once. It’s darn cool, even given the shared velocity. Speaking of velocity, its slider has a MIDI Easter Egg of sorts. When in Edit mode, the slider continues to respond to its usual incoming MIDI CC. Therefore, your master keyboard or sequencer can tweak any selected parameter without the need to delve into the SysEx documentation. The MIDI functionality isn’t included in the manual so you’ll need to locate the spec online: as a quick summary, the Volca FM responds to notes and pitch-bend but not mod wheel, velocity or sustain. Crucially, I felt, you can’t select its sounds using MIDI Program Changes. I’m hoping that Korg will reconsider and add this obvious feature in a firmware update. Korg have done it again! Cramming an FM synth with DX7-level complexity into the Volca format could so easily have been a disaster, but instead it’s a triumph. Seemingly minor innovations such as the dedicated algorithm selector and envelope controls help make FM fun and — dare I say it — intuitive. But the fine detail is there when required. The sequencer serves as a handy, if brief, notepad, but becomes more significant once you take pattern chaining and motion sequencing into account. Who would have dreamed that sequencing a basic FM parameter such as algorithm selection could generate wild, circuit-bent glitches or even passable impressions of a swept wavetable? Not I — until now! Of the many unexpected delights, foremost was the Volca FM’s close affinity to the DX7, especially when it came to exploiting the thousands of patches to be found online. While three notes will never provide a satisfying piano or organ, it’s not much of a limitation when sequencing, nor is the single velocity value that’s applied to all notes. Personally, I felt more let down by the lack of response to MIDI Program Changes. After all, the Volca FM is a fab-sounding module that has plenty of MIDI control otherwise. And a MIDI output socket could have been a real asset, giving Korg the option of regular SysEx backups rather than the old-style data dump method implemented. Ultimately, miniature synths aren’t for everyone, but within its ambitions, the Volca FM is a brilliant achievement — and it’s affordable too! On this evidence, FM synthesis still has plenty to give, and by ramping up the accessibility, Korg have taken an important step towards bringing it back. Yamaha’s Reface DX (reviewed SOS November 2015) has a simpler (4-Operator) FM architecture but scores with higher polyphony, effects and a physical mini keyboard. Discovered by John Chowning in 1967, FM Synthesis was later licensed to Yamaha to power their ground-breaking DX range. Arriving in a flurry of new terms and loaded with striking presets, FM was a world away from the squelches and sweeps of analogue, yet at its heart was a familiar tale of oscillator modulation. Chowning had pushed vibrato far past typical speeds to find himself in a realm of audible side-bands: extra harmonics that piled in as the modulation level increased. More importantly, where the two oscillators were harmonically related, the output was also harmonic. It followed that if you could ensure the modulation source would be a ‘musical frequency’ — ie. if it were tracked perfectly from a keyboard — you’d have the makings of an innovative new form of synthesis. The FM of the early ’80s was based on digital sine-wave oscillators, six in the case of the DX7. Depending on the currently selected algorithm, some oscillators (the carriers) produced audible signals while others (the modulators) did not. If you dig out an algorithm diagram for the DX7, you’ll see the full list of available routings and in the very last (number 32) all are carriers. The algorithm therefore operates in the same way as additive synthesis, but with the exception that a single operator has a feedback loop and can therefore modulate itself. In contrast, algorithms 16-18 contain just a single carrier. Modulators act on this and also on each other, spilling out harmonics even the most experienced synthesists couldn’t anticipate. It’s no wonder early DX7 adopters struggled, although the manual was actually quite helpful. In it, the frequency relationships between modulators and carriers were shown as ratios, with a ratio of 1:1 (ie. equal frequencies) shown to produce a waveform roughly equivalent to a sawtooth. A ratio of 2:1 (modulator 2x the fundamental frequency) was more square-like and as the ratio continued to increase, so did the characteristic high-end fizz. In cases where the modulator was a non-integer multiple of the carrier, the result was atonal, metallic or bell-like. Further complexity was added in the form of multi-stage envelopes allocated to each operator’s amplitude. While able to reproduce the shapes of most acoustic and electronic instruments, there were many rate and level values to deal with — one at a time — which quickly evoked a misty nostalgia for the simple ADSR. However, in order to introduce time-based timbral changes, you needed to identify modulators, then dive in and tweak their envelopes. One of the crowning glories of Yamaha’s FM was the DX7’s keyboard, particularly its response to velocity and aftertouch. From a well-programmed patch, the performer could exploit the velocity response of individual operators to great effect. And thanks to rate and level scaling, modulators could be given different weightings at extremes of the keyboard. As a result, many of FM’s best sounds were those that, while obviously synthesized, hinted at some undiscovered or alien acoustic instrument. Although no longer a Yamaha exclusive (the patent expired in 1995), Chowning’s FM deserves more than its brief spell in the sun. It was never supposed to be a replacement for analogue but an ideal partner in which, instead of filtering already-rich waveforms, you started simply and added harmonics from scratch. A lot of the fear surely came from that single data-entry slider and tiny window, or perhaps the scary equations invoked in explanation. It’s a powerful, portable FM synth. Which is tweakable and polyphonic. Sequencer features pattern chains and motion recording. Ignores MIDI velocity and Program Change messages; has just a single velocity for all three notes. It deserves a better manual. The bar has been raised again as Korg’s Volcas continue to surprise and delight. Although it only just qualifies as polyphonic, the Volca FM, with its DX7 brain, knobs and motion sequencing, breathes new life into an under-rated form of synthesis.